The “H” shaped foot assembly stabilizes the clamp in two dimensions giving dual-axis stability to the work piece and industry leading clearance from the work surface. Combined these with 36 inch black pipe and so far they have been working great. Would recommend these and I'd definitely buy them again if I needed more. 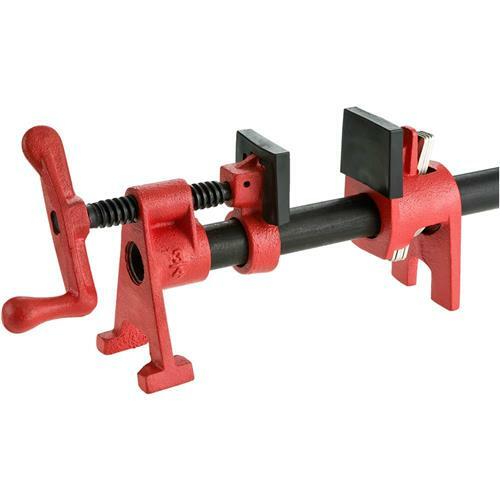 These clamps elevate the work off your bench and allow plenty of room to turn the handle. Excellent clamps. I like the pipe clamps very much,also great clamps for a very fair price. just bought this item and am very pleased with it. WOW!!!! It really makes a difference.Highly recommend this product to anyone that has thought about purchasing it.